The Music Lesson, this Norman Rockwell painting, appeared on the cover of The Literary Digest published September 24, 1921. 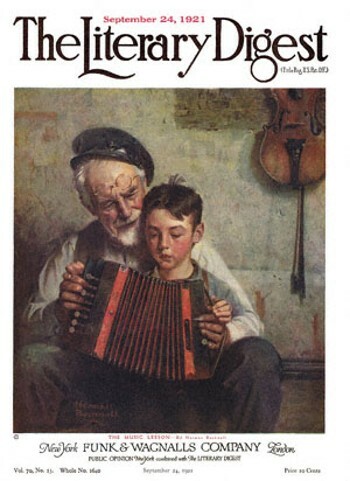 The alternate title for this work is Old Man and Boy Playing Concertina. This illustration was Rockwell's thirtieth painting featured on the cover of The Literary Digest. The Digest featured Rockwell artwork on the cover twelve times total in 1921 alone. Each month during 1921, The Literary Digest published a Rockwell cover. Starting with his first cover illustration in 1918, Boy Showing Off Badges to the last, The Night Before Christmas in 1923, Norman Rockwell artwork was published on The Literary Digest cover forty-seven times in all. This illustration is reproduced on page 57 of Norman Rockwell, A Definitive Catalogue by Laurie Norton Moffatt. The last reported location of the original oil on canvas painting, 22 x 20 inches or 56 x 51 cm, was in the collection of Berry-Hill Galleries. It has apparently changed hands since then, since it is not listed on their website. Any information on its current location will be appreciated. With this painting, Norman Rockwell give us a glimpse into family life during 1921. The Music Lesson was only one of 47 Norman Rockwell Literary Digest covers; here is the list of more Norman Rockwell Literary Digest scans. The old man is helping the young boy learn how to play the concertina, a smaller hexagonal version of the accordion. A violin hangs on the wall behind them. Obviously, the old man is an accomplished musician. The little boy's hands are yet not big enough to play the concertina. His hands are resting on top of the old man's larger hands. Perhaps he is just learning how to use the bellows.Or perhaps this is just his first lesson. The little boy has much still to learn about playing the concertina. Do You Have A Great Story, Opinion Or Contribution About The Literary Digest?